Are you going to a party at the county jail? Or perhaps you are all shook up about what to wear this Halloween? This year, you're the king. When you enter the building you're expected to shake, rattle, and roll. 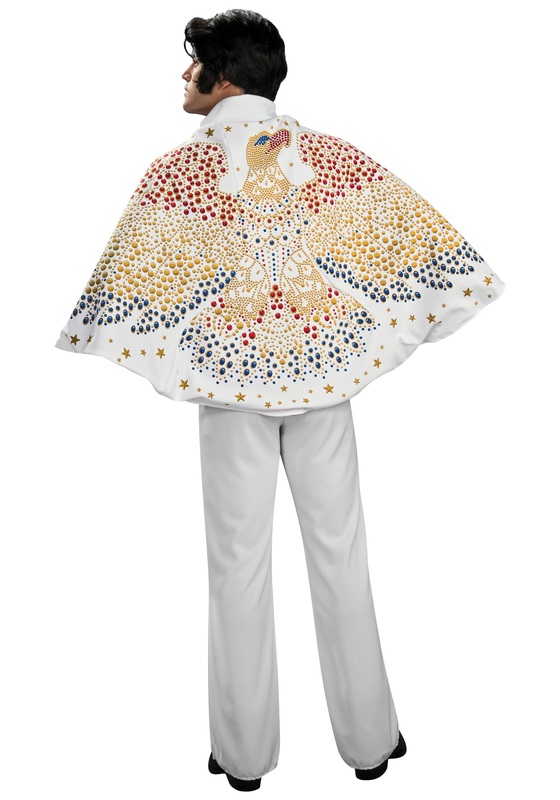 In this Adult Elvis Cape you'll be able to rock the night away. Uh-huh! You'll thank us, thank us very much! The officially licensed cape is a must-have for any Elvis costume. You can’t rock the stage as a believable impersonator without his signature cape. This cape is made of 100% polyester and measures approximately 56” across the top and is 26 ½” long. The outside of the cape is white and the inside is accented red. A faux gold chain clips on either side to hold the cape in place around the neck. The true iconic part of the cape is the large screen-printed rhinestone eagle on the back. Don’t get on stage without this showstopper piece to your Elvis costume! I've used this cape to end my shows. If only it was lined with blue. All n all, great.